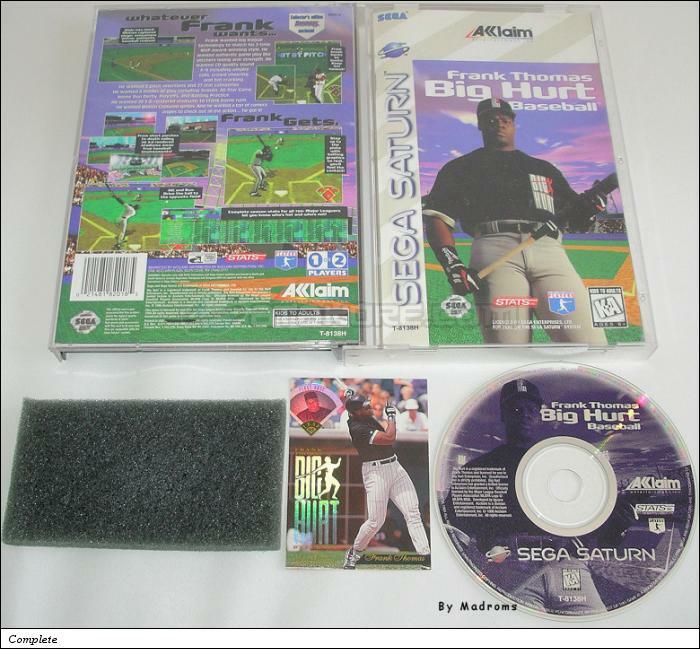 Frank Thomas Big Hurt Baseball is a Sport - Baseball game, published by ACCLAIM, which was released in the United States of America in 1996 for the Sega Saturn. A baseball game featuring Frank Thomas and with a MLBPA license could be a good game. yes, could be. This game has some good points: all the major league players and stadiums, loads of stats and different modes to play with (Exhibition, Season,...). Unfortunately, this game has also 2 flaws. The first one is the batter's timing. It takes some times for the batter to swing after you pressed the button, so you must swing not when the ball is near you but when the pitcher is throwing it. The second flaw is a poor gameplay. Only 1 button to swing (no control on where you want to throw the ball) and only 3 button to control the pitcher (one button for each type of pitch, no control during the throwing). You don't even control where the fielders must go to catch the ball.